Hello! Today I'm back with another quick swatch, this time of Models Own Hypergel polish 'Blue Glint'. I picked this up a while back when Nail Polish Direct had a big sale, (along with several other Models Own polishes, a couple of Color Clubs, China Glazes and some Barry Ms - I had quite the haul). Read on for my swatch and more info. 'Blue Glint' is a vibrant, bright blue creme. 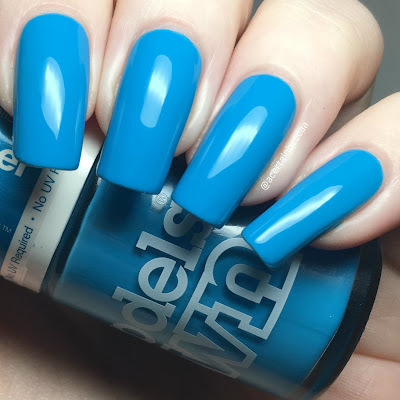 Being a hypergel, the formula is slightly thicker than other Models Own polishes, but is still super smooth and easy to apply. It is also almost completely opaque after the first coat. Depending on your application I think you may be able to get away with just the one, although I did need a quick second. Below is two coats with topcoat. What do you think? I'm not sure why I waited so long to wear this one, it's such a gorgeous shade of blue! I do tend to expect good formulas from Models Own, especially the hypergels, and this didn't let me down.